Today, we visited the National Portrait Gallery, which should be called the Rich White Male Portrait Gallery. Generally all of the paintings were of white guys well into the Gallery’s 20th Century portions, with the exception of any female monarch. Starting in the 1950’s or so, there were a few more token minorities and/or females throughout the remaining small portion of the museum. In my opinion, this lack of diversity is completely unacceptable for a vastly multicultural city like London. While wandering around the illogically designed museum (during which I frequently was forced to cross over my own path just to see the paintings in chronological order), I came across several paintings that caught my eye. 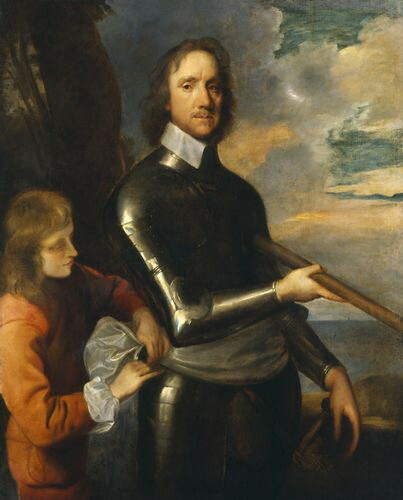 The most notable of these is a portrait of Oliver Cromwell that was painted by Robert Walker circa 1649. As a political science major, I was drawn to this painting not so much for its artistic value (though it is a nice-looking painting) as for its sitter’s political accomplishments. Cromwell is best known for serving as Lord Protector after the dissolution of the Monarchy at the end of the English Civil War. Fighting for the Parliamentary forces, he played a large part in Britain becoming a republic as opposed to the monarchic structure it had used for hundreds of years. This period of British history motivated several of the greatest philosophers of all time to venture into the world of politics, meanwhile formulating the basic ideas that have influenced every democratic government since. The likes of Thomas Hobbes and John Locke (both featured with Cromwell in the National Portrait Gallery), released these ideas in Leviathan and The Treatises of Government, respectively. Though they are often thought of as very similar, Hobbes and Locke were on opposite sides of the Monarchy (Hobbes) v. Parliament (Locke) war. Their ideas on the legitimacy of government (mostly related to the idea of social contract theory) serve as the cornerstone to the American system of government, which has in turn served as a template for governments all over the world. It’s clear that the victory by Parliamentary forces, led by Mr. Cromwell, in the English Civil War set the stage for one of the largest global political changes in the world’s history, which is why both the period and the man are so interesting to me. Before visiting the National Portrait Gallery today, I predicted that while much of the museum would feature only the white rich and famous, the contemporary collection at least would attempt to capture the multi-ethnic character of England. In that regard I was disappointed. In terms of subject matter, the museum evolved very little throughout. As I finished the final gallery, I gradually realized that this particular museum does not portray (and does not intend to portray) the faces of England as a whole. 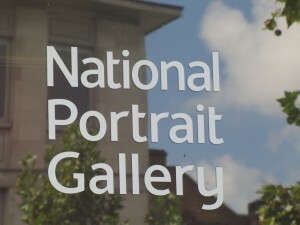 In fact, The “About Us,” section of the National Portrait Gallery’s website explains that the museum’s goal is to, “promote through the medium of portraits the appreciation and understanding of the men and women who have made and are making British history and culture.” This does not mean the day to day making of history and culture, accomplished by the people who make up its population. Its purpose is first and foremost to portray the individuals who have made it into the history book, and unfortunately, that group remains fairly homogeneous. 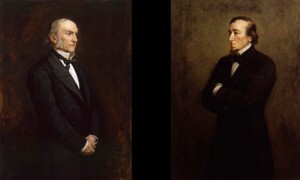 However, the Portrait Gallery does show change through the years in the art of portraiture. 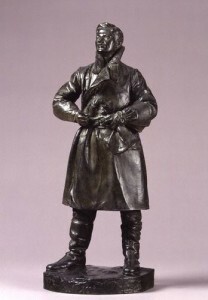 Throughout most of the museum, any given time period has a corresponding style. Clues are in the crafting of every detail, down to the folds in the fabric of the sitters’ clothing: for example, in any painting in the Tudor section, the fabric tends to look particularly stiff. Many of these paintings can be easily assigned to a time period, but much less easily to a particular artist. Since the main goal of portraiture for many years was to portray the sitter in a flattering, distinguished, and fashionable light, creativity was low in priority. The newest paintings depart from this long tradition of conformity. One room contains numerous paintings of nearly photographic quality, among a few actual photographs of members of the current royal family. These look in a sense tradition to an extreme, since they so closely achieve the old goal of capturing exact but flattering likenesses of the subjects. 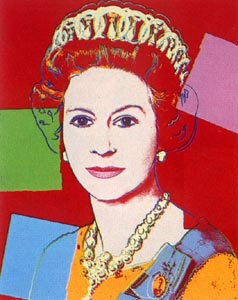 However, the room around the corner features three Andy Warhol prints of Queen Elizabeth II, in which features are simplified in bright colors. In these, the queen is a pop culture icon first and foremost. Some of the recent paintings were so thick with paint or otherwise distorted, that painting style itself was more prominent than the famous individual’s features. 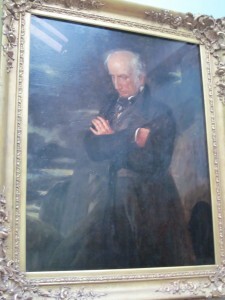 Probably not coincidentally, the contemporary section contained many more self portraits by artists. With creativity as a main focus of portraiture today, the artists themselves are ready subjects for their own experimentation. 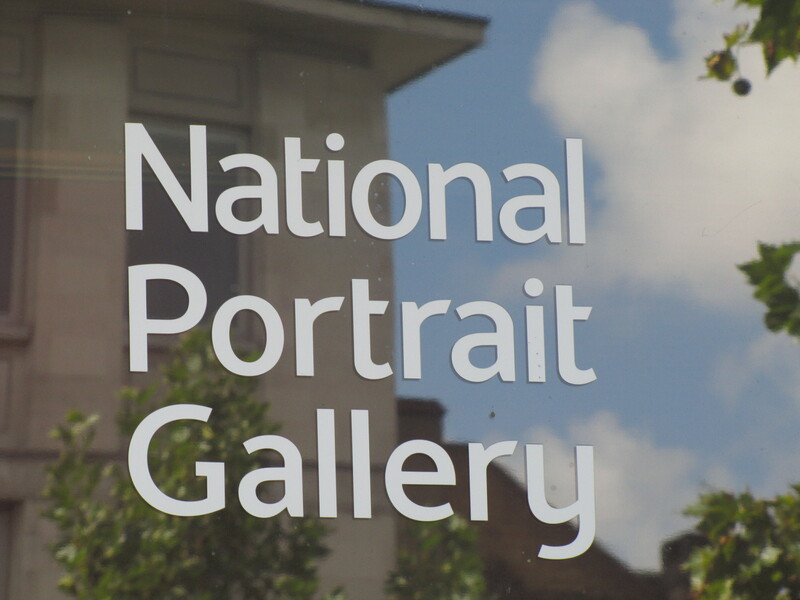 Personally, I had been looking forward to going to the NPG ever since we got here- some of my favourite images, absolutely iconic to my field of study are housed here. And I was not disappointed. People have been going on and on about how the Gallery only had portraits of white, rich men but, strictly speaking, that’s not true. The number of female portraits rivalled, if not exceeded the portraits of the men, certainly not during every era, but overall. As for the other considerations, think about the cost, time and hassle it would have been to get your portrait painted- from the Tudor era to Victorian times (at least) portraits could only be afforded by the wealthy or the important, generally meaning royalty or aristocracy. As we got further on in time, there were more portraits of professionals: important scientists, artists, poets, even some Shakespearean actors! However, these people all had powerful (read: rich) friends or connections and I think a more accurate characteristic of the majority of sitters was celebrity rather than wealth. As has been previously mentioned, there was more diversity in the contemporary (1960s-present) sections of the Gallery but this may not satisfy everyone as many of these were not wholly portraits per se but photographs, sculpture, etc. 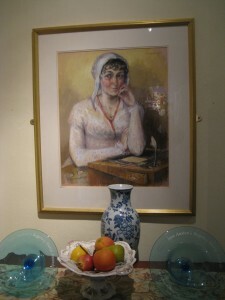 The sad fact is, now that more people could actually afford painted portraits, the medium is a dying breed. Photography has taken over. This is an image that I- as an English major specialising in 19th Century British Literature and a devoted admirer of Jane Eyre, my all-time favourite book- have seen countless times, but there was something completely magical about seeing it in the flesh, as it were. 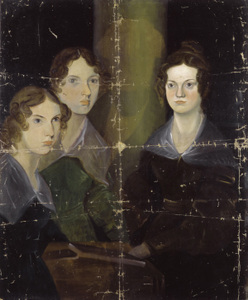 There are many reasons that I love this portrait: it includes Charlotte (who I practically worship), the oft-neglected Anne (whose books I really enjoy and think should be read more), and the bane of my existence Emily (I think Wuthering Heights is probably the worst love story of all time) and shows them in what was really their natural setting: their home. The siblings were very close (several other children had died before their teen years) and I think it’s very significant that the portrait was painted by the only brother, Branwell. Branwell was a very tragic figure: he drank himself to death in 1848, squabbled away his money and talent (both as an artist and a poet) and left his sisters alone to care for their ageing father. 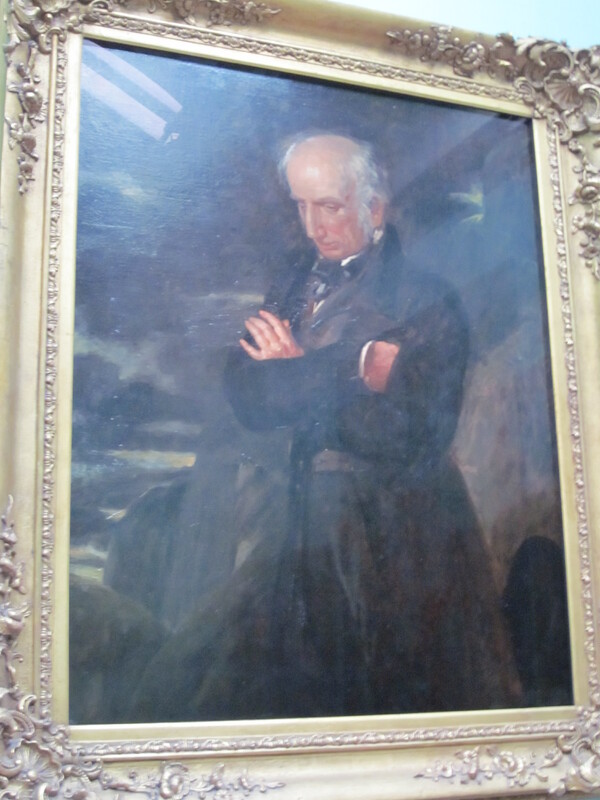 I had not really noticed the details of the portrait before: that “pillar” in the middle, which my eyes had frequently just glossed over, appears to actually be a painted-over self-portrait of Branwell. Whether he had just changed his mind about including himself in with his sisters or was simply unhappy with the result is unknown, but there is an eerie symbolism to the ghostly silhouette that remains amidst the figures of the sisters. Two months after Branwell’s death, Emily sickened (likely with a fever resulting from a neglected cold) and died very quickly. 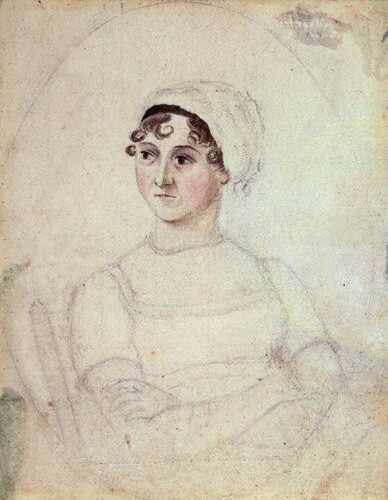 Anne developed consumption not long after and died within six months of her sister. This left Charlotte the only surviving Bronte sibling until her own death about six years later. It is hard to view the siblings together, apparently happy- approximately 14 years before their tragedies began-and forget this sad fact.